MANIA – Treasure Hunt is one of the best event organized by BikeStudio. Bike Studio Mania served as an opportunity for the riders to explorethe city like never before, while enjoying every moment of the ridingexperience. The pleasant weather further enriched the outing and made cyclingthe distance seems effortless. Treasure Hunt is organized for all age groups.Recently, Hyderabad bike studio has done Mania in July, 2017 from Banjara Hills to Hi-tech City, covering adistance of 20kms,on Sunday. CorporatorVijaya Lakshmi Gadwal flagged of the ride at Banjara Hills, with participantsof all age groups from different walks of life, taking part in the ride. 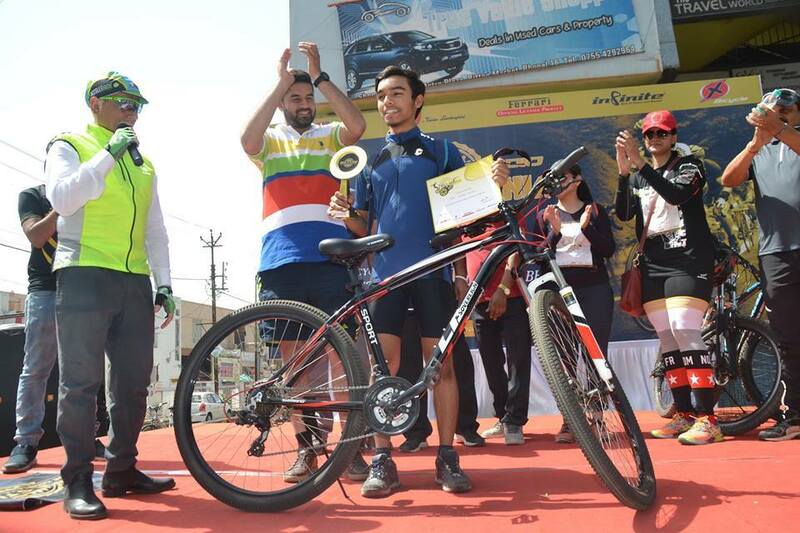 The winners of the ride were rewarded,with Guru murthy winning the first prize of a bicycle worth Rs 25000, DrVignanwon the second prize, a bicycle worth Rs 15000 and a special prize ofaccessories worth Rs 7000 was won by Sindhura. All the participants werepresented with participation certificates. Bike Studio brought differentcycling communities of Hyderabad together for the occasion, which also servedto ignite interest in non-cyclist to take up cycling for health and fun. EVENTS – Bike Studio also performing some events at top level and middle level. On4 nov, 2017, Bike Studio Aurangabad has participated in Deccan Cliffhangerrace. Deccan Cliffhanger was MostPrestigious Ultra Cycling Race 643 Km from Pune to Goa. Bike Studio Team Got First Rank inDeccan Cliffhanger with the least time of 25 Hour 50Min. First RAAM (RACEACROSS AMERICA).Our Team Members are Dr. Praful Jatale, Aakash Kanojia. Joy& Varsha Sasane. Apart from above, Bike Studio alsodoing some other small events on weekend or any day in a month such as Weeklyrides, Servicing camps, displays, exhibitions participation and so on. Bike Studiowas established in 2015 and is a first ever Joint venture between Thailand& India based companies to market Bicycles & Kids Toys of very HighQuality & world class designs to the Indian consumer. The Products of BikeStudio are being sourced from Thailand & Sri Lanka and are being sold tothe Indian consumers through a vast network of about 300 dealers all over thecountry. They give best price advantage to customers as compared to thecompetitors. Bike Studio has all kind of bikes for all age groups. Bike Studiois an exclusive brand outlet for LA-Sovereign and its product categories,catering to all bicycling needs from bikes, accessories to spare parts andservices under single roof. The present product categories under Bike Studioinclude LA- Sovereign Series, X-Bicycle Series, Angry Birds Series, InfiniteSeries, Lamborghini, Ferrari and Romet. Bike Studioorganized a monthly event at different stores. Bike Studio also takes part indifferent type of rides and races. We have 10 Bike Studio stores at differentstates and all are performing event at their own level. Every store is trying to get initiative byparticipate in events. Here, wehave mentioned some best events organized by our Bike Studios on higher level.